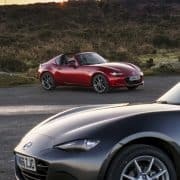 This month we played host to the UK launch of the Mazda MX-5 RF. Around 90 journalists, over the course of three days, were flown by private jet into Exeter airport where they picked up one of the brand new cars. They then drove to The Great Barn for lunch, as well as a presentation about the new range. The all-new Mazda MX-5 RF Retractable Fastback will go on sale in the UK on the 4th March 2017.